Coffee Creek Correctional Facility has named our own Patty Namba as CCCF Volunteer of the Year. 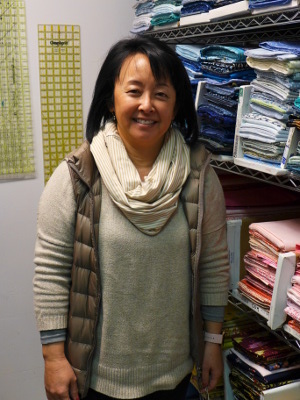 Patty has been a CCQ instructor since 2012, currently teaching in our Wednesday evening class. She also serves on our Board of Directors, heads the PR committee, and co-chairs our Annual Sale and Fundraiser. A lot of us in CCQ are retired, but Patty works full time. We don’t know how, but she finds time to quilt too. Patty especially enjoys making scrap quilts and typically makes five or six of them for donation every year. CCCF recognized Patty with a letter, a certificate, and a trophy with her name engraved on it. She also gets the temporary use of a highly-valued close-in parking space for the rest of the year.